We all have superstitions that play into our grooming habits. For some, it’s a pair of hidden underwear that makes us feel sexier. For others, it might take the form of a prized comb or the belief that drinking more water will transform our abs into Channing Tatum’s. But now we’re blessed with the knowledge that, according to an infographic from Dove Men+Care, 1 in 4 men believe that avocado toast will make their hair better. We’re hoping this means men are actively choosing toast that will push them towards the unattainable goal of John Stamos’s hair. While this toast-centric belief might sound somewhat absurd at first, it actually makes a lot of sense given the (sometimes disputed) amazing health benefits of avocados. Avocados are jam-packed with over 20 vitamins and minerals, including vitamins B, C, E, and K, riboflavin, niacin, folate, pantothenic acid, magnesium, potassium, lutein, beta-carotene, omega-3 fatty acids, and anti-aging antioxidants. Soooo, technically, if these men are eating avocado toast every day, it just might make their hair and skin look extra. We still prefer the concept of a sizable percentage of men believing in magic beauty toast. 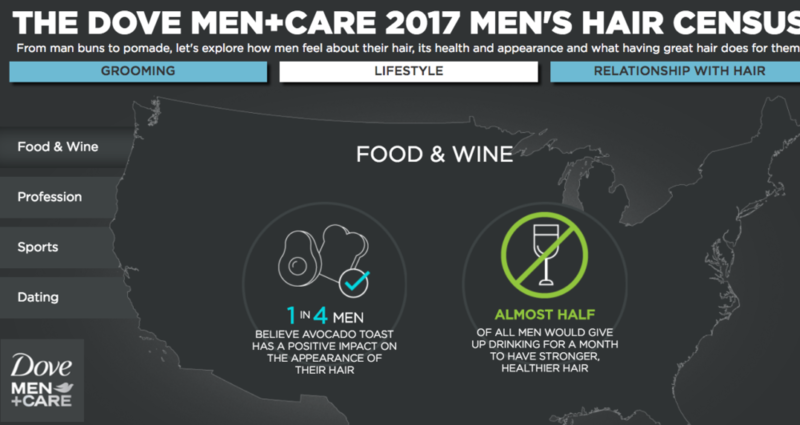 The avocado toast tidbit wasn’t the only interesting finding from Dove Men+Care 2017 Men’s Grooming Research. They also found that as many as 72% of guys today are always looking for ways to improve their grooming habits, so we just might need to recommend them some skin care roundups and hot breakfast spots with avocado toast. Another finding was that as many as 1 in 3 guys feel like they are stuck in a “rut” when it comes to their grooming routine. This is an understandable quandary we all find ourselves in from time to time. In this case, we might suggest they spice it up by circulating different types of toast. You can read all of the findings here — they are fascinating.